Upton Charles is a lot like you and me. He likes to be with his family, play with his friends and go on nice walks. 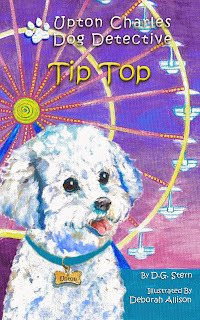 Except Upton isn’t like you and me…because he is a little white dog, a Bichon Frise (that’s “BEE-shon free-ZEY”). Upton is also very smart and knows an important clue when he smells one. 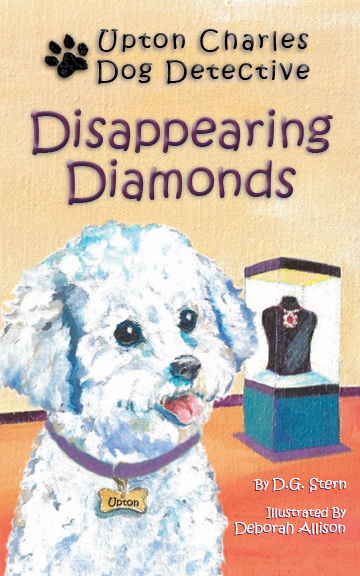 Our dog detective is recruited to help find the Van Camp diamonds that have disappeared from the local museum. Join Upton as he sniff out evidence to find a valuable missing necklace in Disappearing Diamonds. Upton and the rest of the Charles family are on vacation in a small coastal town in Maine and something VERY fishy is going on. Along with his new friend, Storm, the dog detective discovers an abandoned boat near Shell Light. Upton puts his nose to work sniffing out clues…which lead to the secret of the lighthouse. Our inquisitive canine, a Bichon Frise (that’s “BEE-shon free-ZEY”), helps answer a tricky question: What’s real and what’s fake? 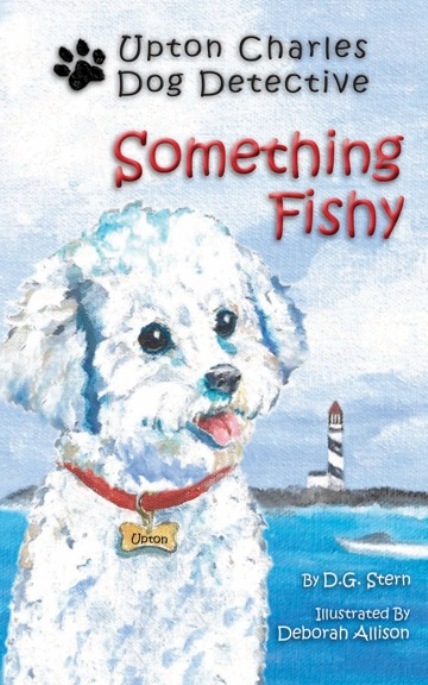 Follow Upton as he gathers evidence and puts together pieces of the puzzle to solve the mystery in Something Fishy. Upton Charles and his family are in New Hampshire for a weekend ski vacation and our canine investigator meets three Saint Bernards. But it would not be an Upton Charles adventure without a mystery. 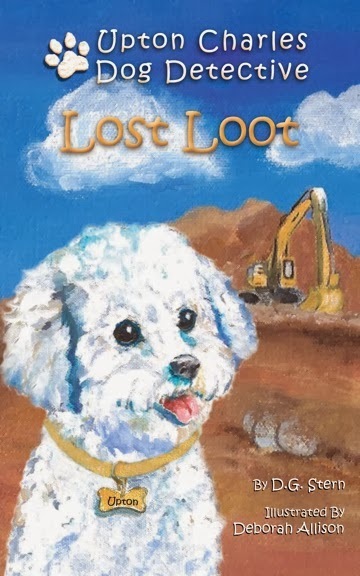 Our sleuth is a Bichon Frise (that’s “BEE-shon free-ZEY”), who is quickly on the trail of a long-lost treasure map, buried gold, and the papers of Daniel Webster. The fire is warm, but the case is never cold. 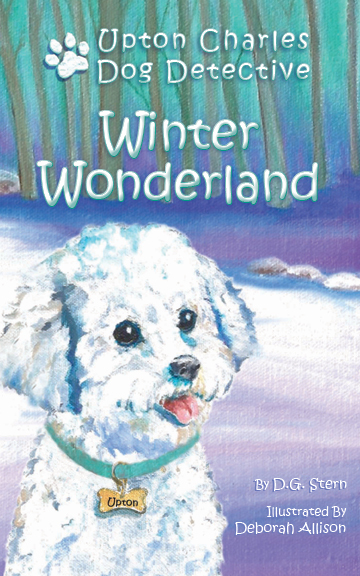 Come along with Upton as he considers two-hundred-year-old clues to solve the mystery in Winter Wonderland. Upton loves to dig for clues, so it’s no surprise that when he and the rest of the Charles family discover some unusual old coins while touring the construction site at the twins’ new school. 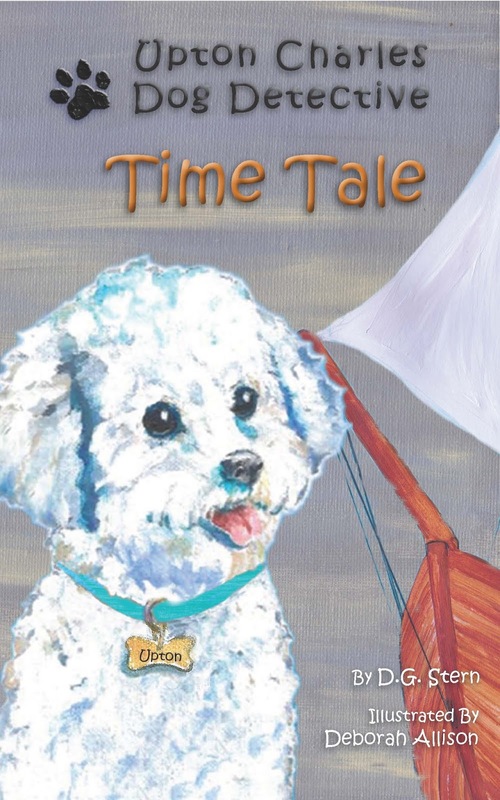 Our sleuth is a Bichon Frise (that’s “BEE-shon free-ZEY”), a little white dog and he always finds himself in interesting situations. And this time, there is something very familiar about the silver dollars he uncovers. Could they be from a bank robbery? Come along with Upton as his efforts lead to the discovery of Lost Loot. When the Chief of Police calls the Charles family to report that a brand new boat and trailer are missing from the boat show, Upton is immediately recruited to apply his detective skills to the disappearance. Our super sleuth is a Bichon Frise (that’s “BEE-shon free-ZEY”), a little white dog, who wastes no time in sniffing out clues that lead to a surprising discovery. During the course of the investigation, Upton is joined by a new assistant. 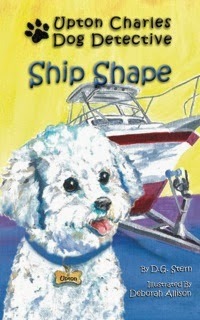 Come along with Upton as he unravels another mystery in Ship Shape. This is about as exciting as it gets. missing reptiles, although he has no idea what a snake smells like. Actually, Upton doesn’t like snakes at all. Come along and enjoy the ride. Watch clues slither by as Upton solves the mystery of Tip Top. While on a walk, Upton and his “human” father, Hank, hear the sound of fire engines speeding to a home around the corner from which smoke is bellowing. Quick work by firefighters eliminates any “real” damage to the house, but when it appears that the thermostat had been turned up to high on a hot summer day, it looks like some serious investigation will be needed. Aided by his assistant, Watson, and the rest of the Charles family, our canine detective is on the case. 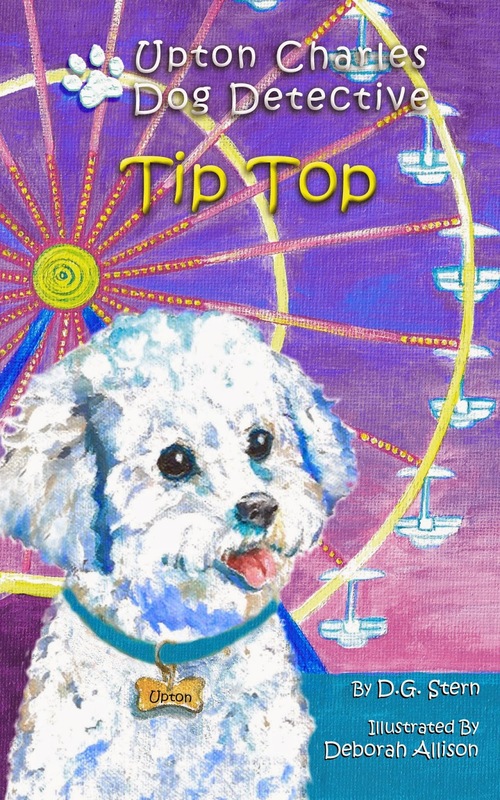 Oh…Upton is a Bichon Frise (that’s “BEE-shon free-ZEY”), a little white dog, and his super sleuth skills will be challenged. 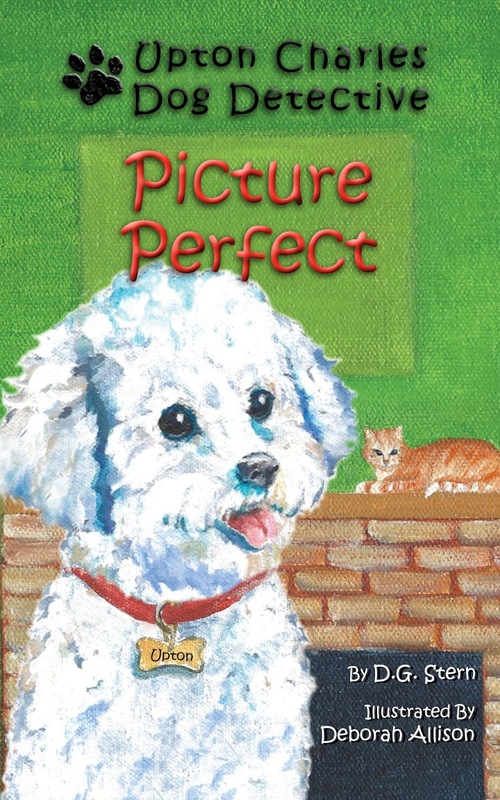 Accompany Upton, Watson, the twins and Mr. Charles as they put together the pieces of the Picture Perfect.